Custom Political Car Signs -Auto Magnets Personalized in Full Color. Promotional, Very Inexpensive. Budget Prices for USA, Canada. Made in USA with Union Label. 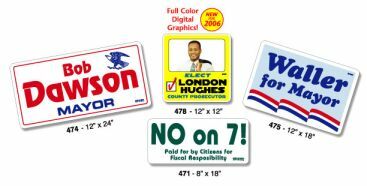 We supply bulk custom auto magnets and magnetic political car signs with your full color imprint, at bargain prices. Use over and over! Provides identification for business owners whose personal vehicles double as company vehicles. Politicians get key name recognition when used on vehicles in parades. Material: White flexible magnetized vinyl, approximately 0.035" Thick. Lowest prices in USA and Canada for wholesale custom auto magnets. American clients pay no taxes. Auto magnets can be applied or removed instantly. Use your car for additional identification at rallies, parades and events. Note: State and federal laws vary regarding identification of those responsible for purchasing, publishing or distributing political advertising. Be sure to provide any copy necessary to meet these requirements if you order political car signs. Free artwork design. We will send you a proof for your approval before production. Unit prices below include your full color custom imprint (unlimited number of imprint colors, including color photos). Material - White flexible magnetized vinyl, approximately .035" thick. Color - Full Color Imprint: Colors created from four-color process. Neon and metallic inks not available. Production Time - Approximately 5 working days after proof approval. Contact us for faster production.